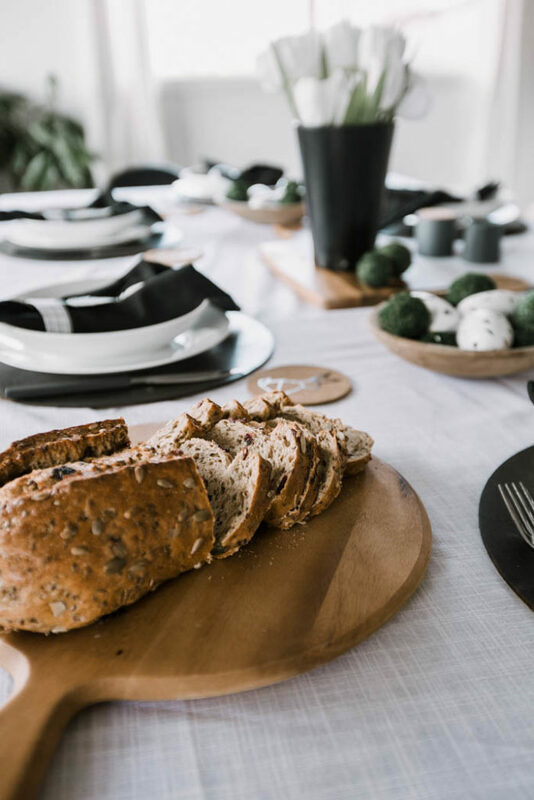 A stunning modern Easter brunch tablescape. 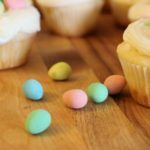 Beautiful, simple ideas that you can make to impress your Easter guests! There are not many times that I do “fancy” tablescapes. Most days I probably don’t even use placemats, lol. But the big holidays win me over – Christmas, Thanksgiving and Easter! 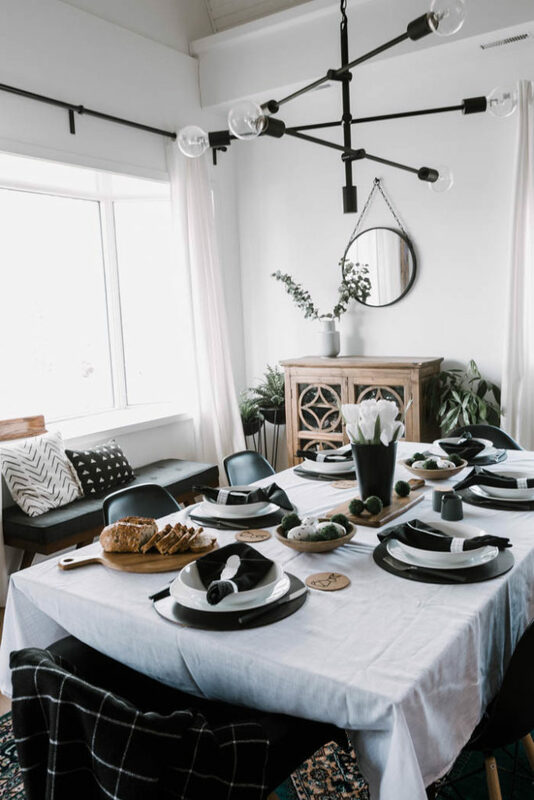 I love going all out – you know… in my minimal, modern style. I haven’t been all that great about sharing Easter content in the past. I like to think it’s because I’m enjoying the holiday with family and friends (which I am! ), but more likely it’s because we are always in the middle of renovations in the Spring and I am totally burnt out! This year however, I’ve had the pleasure of working with Martha Stewart (who is the queen of tablescapes!) 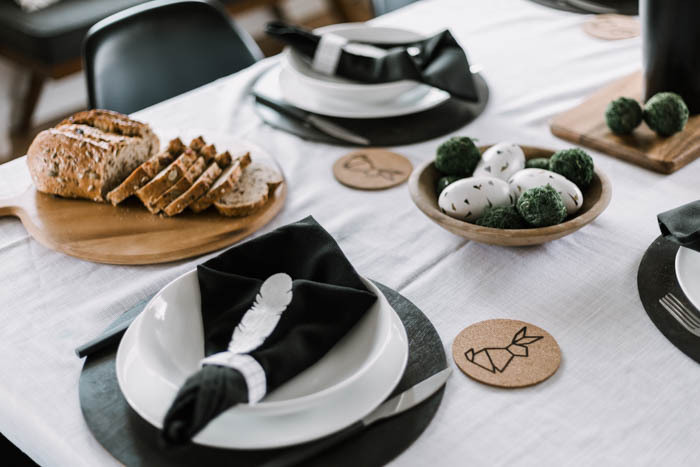 and since this is our last month, I wanted to share one last Modern Easter Brunch tablescape to celebrate our Easter holiday! 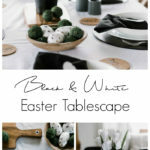 I wanted my Easter table settings to reflect my personal style (black, white, wood, repeat!) 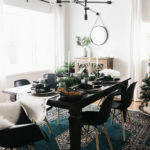 in a chic, modern way, but also to be a bit fun and playful for my girls to enjoy. 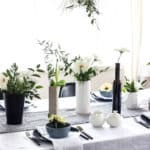 Since this is my final project with Martha Stewart, I wanted to make sure that the table included a couple of fun projects to highlight the Martha Stewart Cricut Explore Air 2 machine! The first project I wanted to make was some cute Easter bunny coasters. Bunnies are a classic Easter decoration, and I knew my daughters would love them! 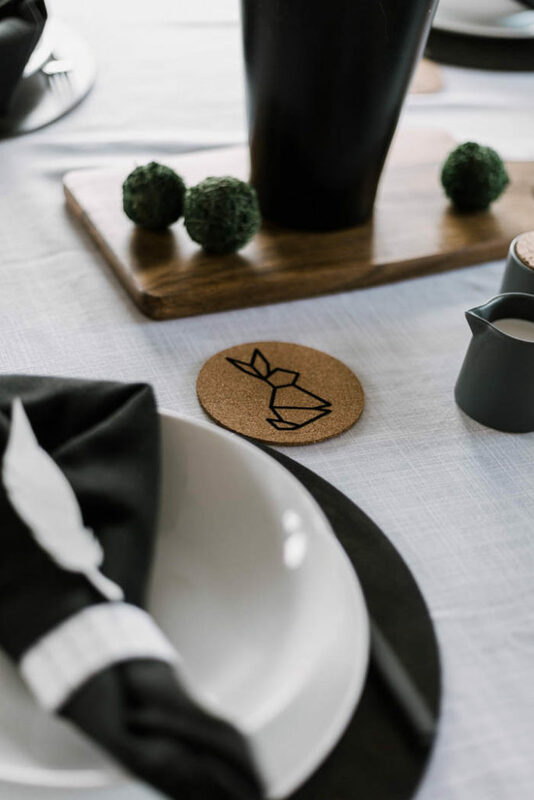 Simply open the Cricut Design Space file, which is set up to make 6 bunny coasters for your modern Easter brunch. Then load vinyl into your Cricut Martha Machine to cut the bunnies out. 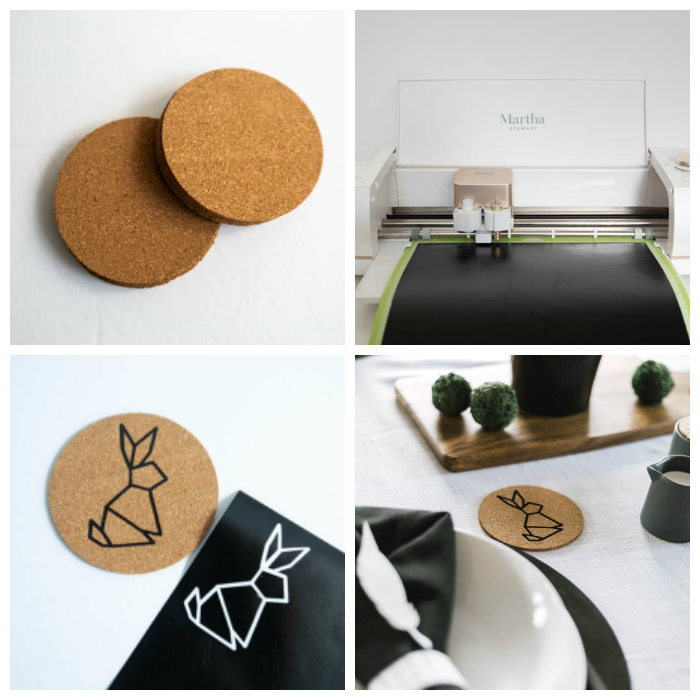 Once the bunnies are cut, you can easily transfer them to the coasters! 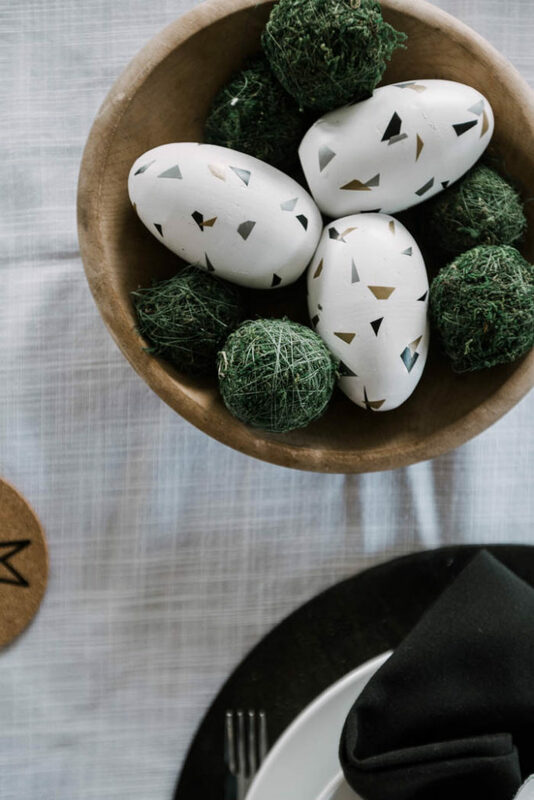 The vinyl likely won’t stay attached to the coasters forever, but it will last for your Easter brunch, and your guests will love them! I love using leather. 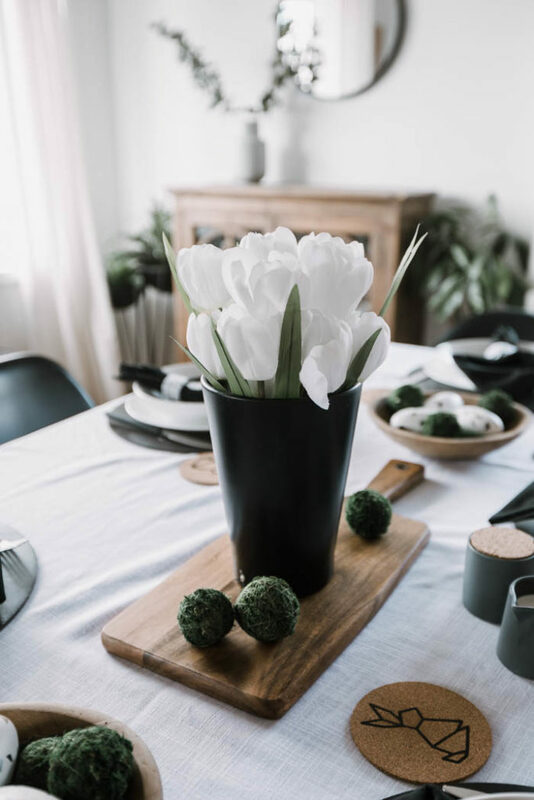 I use it in all kinds of crafts and DIYs, and now tablescapes! 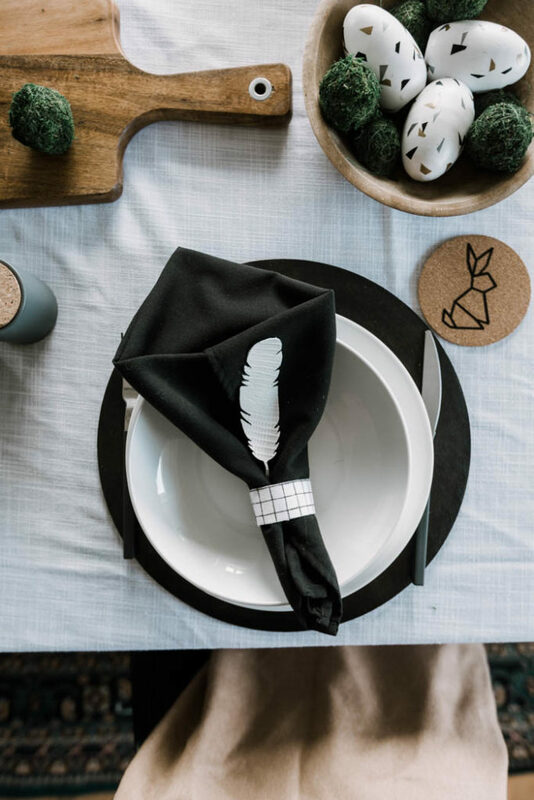 Feathers are another classic sign of Spring and I thought leather feathers would be an elegant way of adding some Easter charm to our table settings. This is another super simple DIY! I made these in about 5 minutes while talking to my mother-in-law! Open the design space file linked above. I modified a couple of design space feathers to make them easier for the Cricut to cut out. Complicated patterns can be more difficult to cut with leather because the leather gets stuck in the blades for the complex designs. Then cut out the leather feathers. Mine peeled very easily off the mat when they were done (my mother-in-law was very surprised! lol). I love how they look resting on the napkins! 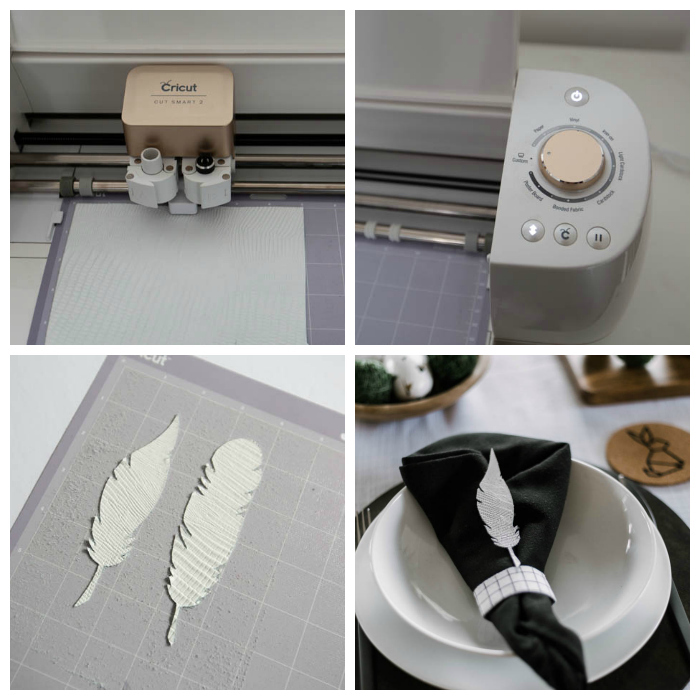 Another cute modification would be to hand letter names onto the feathers or add names with iron on vinyl! 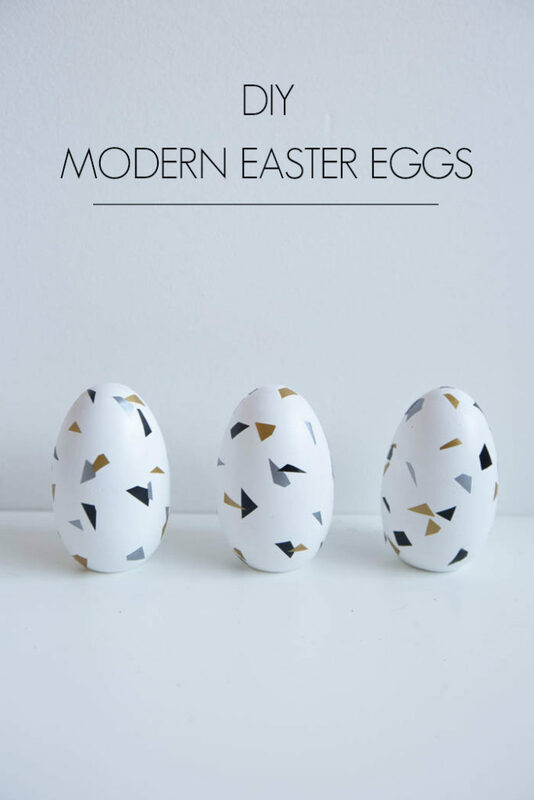 The final Cricut project I included where these DIY Modern Easter Eggs. I shared the tutorial for these guys yesterday, using Martha Stewart paint and vinyl, and I love the patterns that they bring to the tablescape! 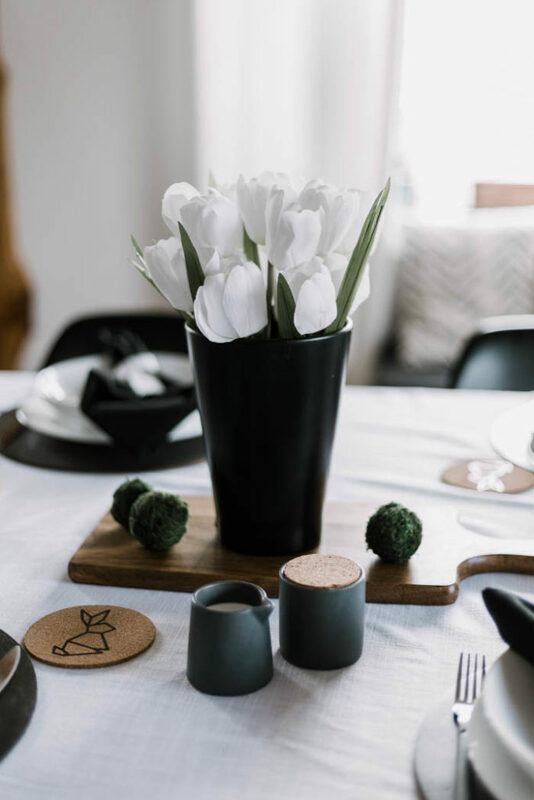 Now that you’ve seen the DIYs we’ve added to the table, with the help of Martha Stewart and Cricut, you can see how they entire table took shape! 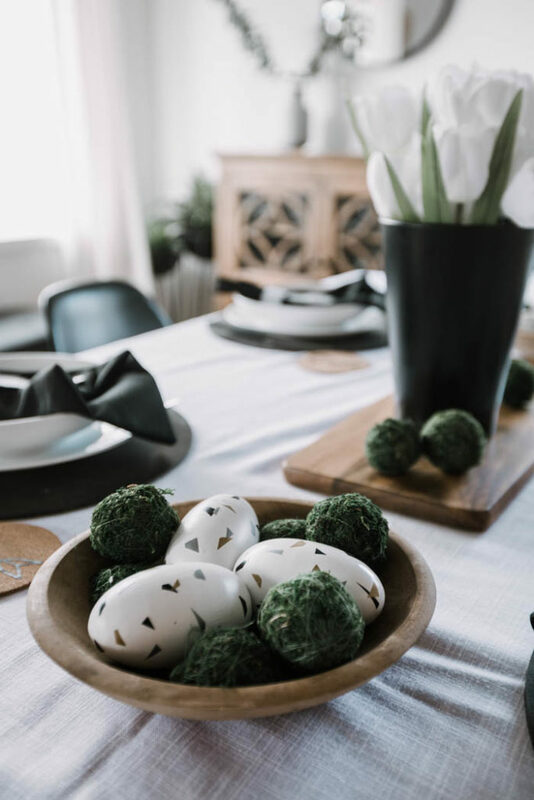 Since I veer towards minimal in my design style, I added a simple centerpiece using some faux florals and faux moss balls that I picked up at Michaels. I grounded them by placing them on a wooden cutting board. I love that they add life to the table without interfering with the ability to visit and chat with guests. 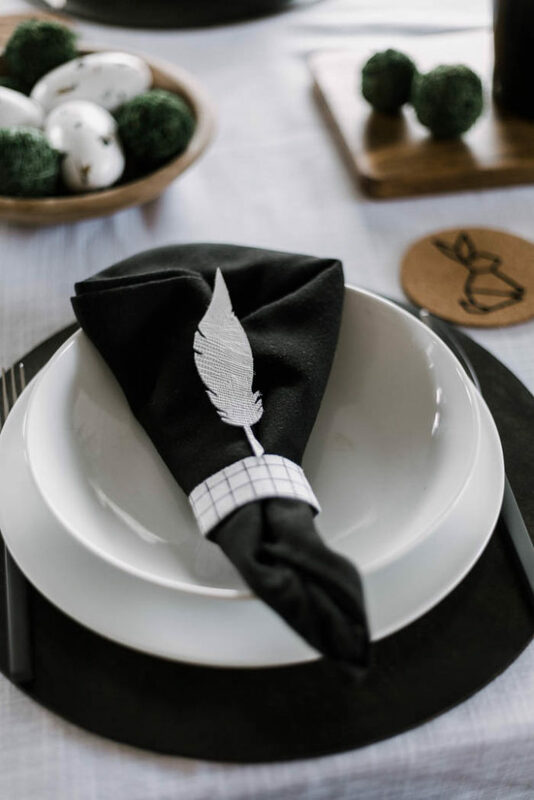 The leather feathers I made were tucked on top of the napkins, which were held together with cute black and white napkin rings. 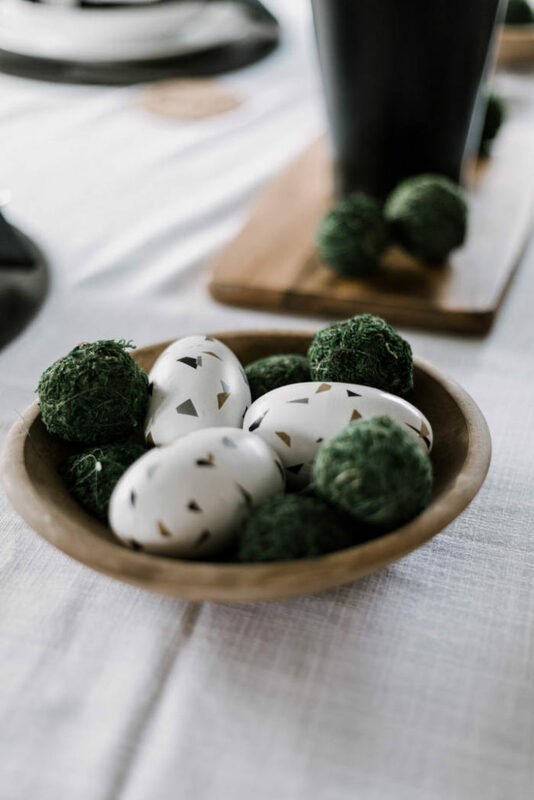 I love the combination of the modern Easter Eggs with the moss balls. The colours really complement each other inside that wooden bowl. 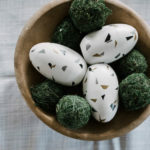 I added a bowl on each side, but they can easily be removed to add food to the table, or can stay if your Easter brunch includes a buffet. I didn’t place any cups on the table because I wanted to highlight the DIY coasters. In reality, we’ll probably have a mix of coffee, mimosas, and juice (for the kids), so it’s probably best that I didn’t share our random cup collection, lol. 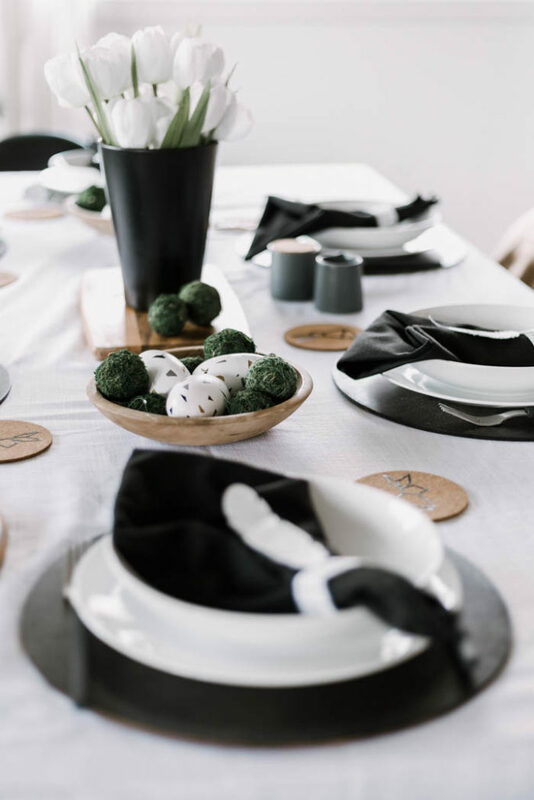 I hope you loved our modern Easter brunch tablescape! If you are inspired to make your own, please share it with me here or on Instagram! 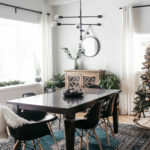 I love seeing our DIY ideas come to life! Don’t forget to check out the Modern Easter Egg tutorial! 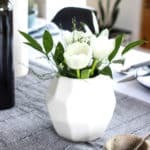 You won’t believe how easy this project is!